Happy Canada Day! We wish everyone a very safe and happy long weekend. 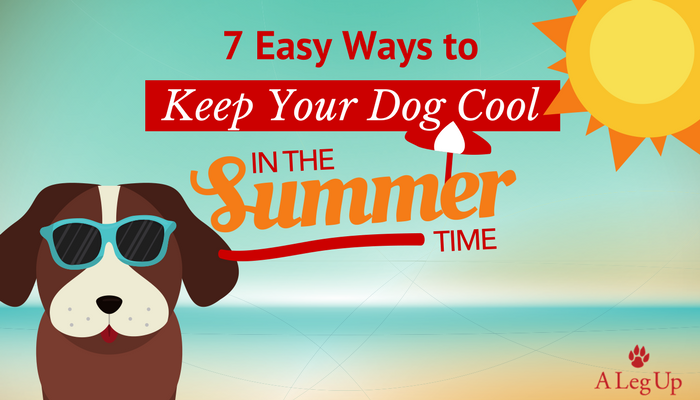 Since this weekend tends to be the unofficial kick-off of summer, here’s some easy ways to keep your dog cool over the next couple of months. Temperatures in your car can quickly reach far beyond that of outside temperature even if you’ve parked in the shade. It’s best to either leave your dog at home or take him with you, just don’t leave him in the car, even for 5 minutes. If you see a dangerous situation with a dog stuck in a hot car don’t hesitate to call your local SPCA who can dispatch someone to help. Keep an extra eye on your dog’s water bowl as they’ll go through it quickly on the warmer days. It’s a good idea to pick up a travel bowl if you’re planning on taking any trips, adventures or camping and picnicking. On particularly hot days throw in some ice cubes to help keep your pup cool. Grab an ice cube tray and fill it with either chicken or beef broth, or your liquid of choice depending on your dog’s diet. Pop those into the freezer and once they’re partially frozen plunk a biscuit or rawhide stick into each one to act as the ‘stick’ (just an extra treat for your dog in this case). There’s lots of room for variation and to get creative with these; check out this infographic we found. Regular brushing will help him shed that winter coat, keeping excess fur to a minimum and helping him to stay cool, not to mention keeping to keep your dog's coat and skin healthy and looking good. If your pup hasn’t had a good brush in a while, it may be time! This one is especially helpful if your dog is of the super-shaggy, long-coated breed. During the hotter summer months you might find your dog seeking out the coolest parts of your home, often on the ground floor, cool tiles or even the basement. He might just forgo the bed all together when it’s warm, but if he’s used to sleeping on his bed, try moving it to one of those cooler areas so he can be a bit more comfortable. Oh man, there are some fun and downright funny things out there we can buy for our dogs. Some are even handy! When it’s warm however, we don’t see anything wrong with bringing home a small backyard plastic pool (generally meant for small children) for your pooch to chill out in. Get him in there and serve him up a ‘pupsicle’ and he’ll be loving the summer days as much as you do!